His star creation was Rat fink. A smelly, fat rodent surrounded by flies, embellished with a grotesque wrap around tail. He never did anything. He never said anything. He had only one pose, he was never in a Saturday morning cartoon much less an animated children’s attraction or action ride (aka Disneyland). But we loved him and drew him constantly on our notebook covers. Big Daddy Roth’s inventive cars like the Beatnik Bandit were made into 1/25th scale models by the prestigious Revell model company. They finally got word of how Roth dressed. Shabby. His relationship with personal hygiene was at best, casual. “You’re a role model. You must dress up.” Said Revell to Big Daddy. So he did. He went to a Goodwill bought tux, tails and a high hat. Still slept in his car but did indeed “dress up” when airbrushing tee’s and sweatshirts at the Irwindale National Speedway and local car swap meets. 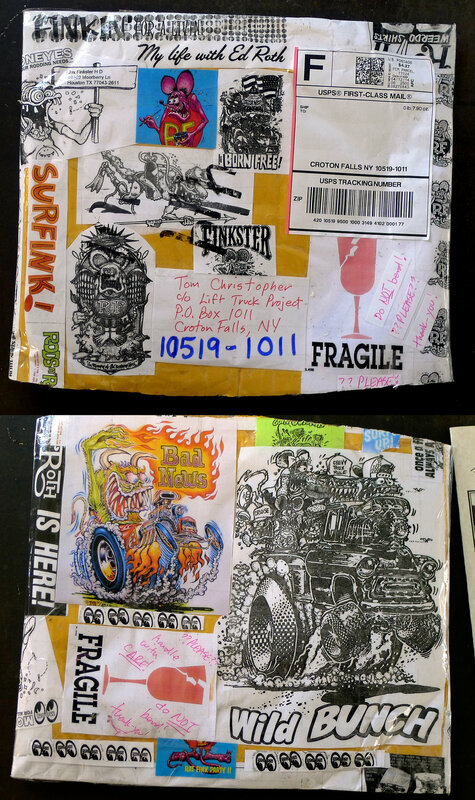 This entry was posted in Uncategorized and tagged Beatnik Bandit, Big Daddy Roth, Ed Roth, Hotrod, Kustom Kulture, rat fink. Bookmark the permalink.